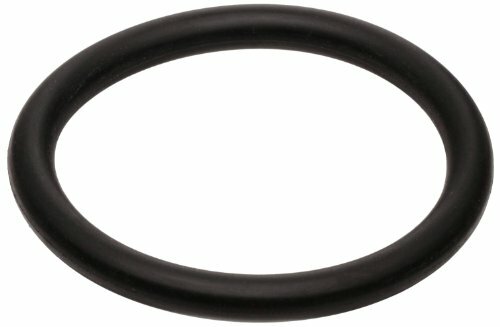 This O-ring is made of black Kalrez 4079 (perfluoroelastomer) and has a durometer of 75A. It has a round cross-section and can be used across a wide temperature range (from 32 degrees F/0 degrees C to 600 degrees F/316 degrees C). Designed for use in a wide variety of sealing applications, this Kalrez O-ring meet standards defined by Aerospace Standard AS568A, which is the Aerospace Size Standard for O-rings. Kalrez 4079 (perfluoroelastomer) has a low compression set and high resistance to many reactive gases, plasmas, alkalis, acids and solvents. It performs well in mechanical applications, under temperature cycling, and exhibits low swell in acids, and aldehydes. Kalrez 4079 is vulnerable to super-heated steam and molten or gaseous alkali metals. DuPont manufactures Kalrez in facilities that are ISO 9000 and AS 9100 registered for quality assurance. The durometer hardness of this Kalrez O-ring is 75A. Durometers measure the hardness of a material and its resistance to permanent indentation. A higher durometer value indicates greater resistance to indentation. On a scale of 0 to 100, a value of 0 indicates that a sample was completely penetrated, while a value of 100 shows no indentation in the sample. The letter following the number identifies the shore scale, which is either shore A or D. Shore A is used for softer plastics, while shore D is used for harder plastics. O-rings provide a pressure and fluid seal between cylindrically shaped, overlapping mating surfaces and are commonly seen in engines, faucets, flanges, valves, and various cylinders. They are circular in shape, with a round cross section, and a hole in the center, similar to a doughnut. O-rings are available in various AS568A dash sizes, which is the standardized sizing for O-rings, and defines the nominal inside diameter (ID), outer diameter (OD), and cross-sectional (CS) diameter of an O-ring.